Hey guys! Are you all pumped up for St. Patrick's Day? We are. My husband and I are hosting a beer tasting night this weekend featuring my husband's Irish Stout. So of course, I needed to make something special for our guests. It started out as just Baileys Pecan Rice Krispie Treats, but soon became something else. 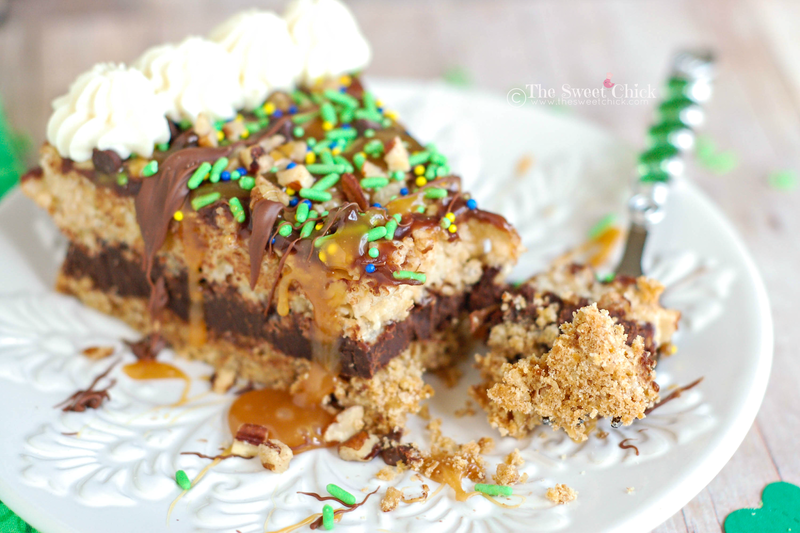 This Triple Irish Krispie Pie also has a pretzel crust , a Dark Chocolate Guinness Ganache, and it's topped with a Jameson Whiskey Chocolate Sauce, caramel, and a Baileys Whipped Mascarpone Frosting. If that doesn't get your taste buds going, I don't know what will. Here's the first layer. A nice, sweet and salty pretzel crust. It's the same recipe I used for my Sweet & Salty Gingerbread Pie back in December. This Dark Chocolate Guinness Ganache is truly amazing. It's made with a reduction of Guinness Draught beer. You boil a whole can down to 1/4 cup to get all the flavor without the alcohol. 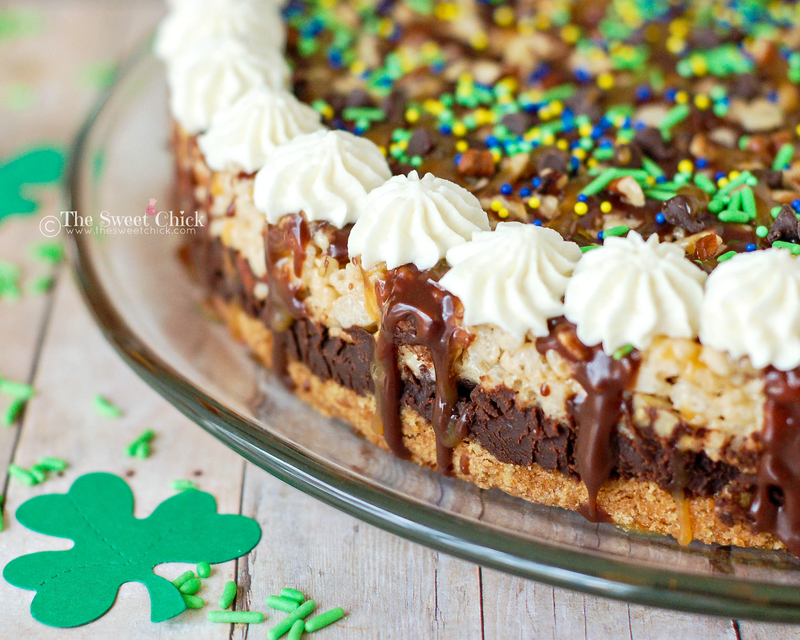 This Baileys Rice Krispie Treats layer is based off of my Dark Chocolate Guinness Rice Krispie Treats I made a few years back. It was really hard not to eat them all, straight out of the pot. 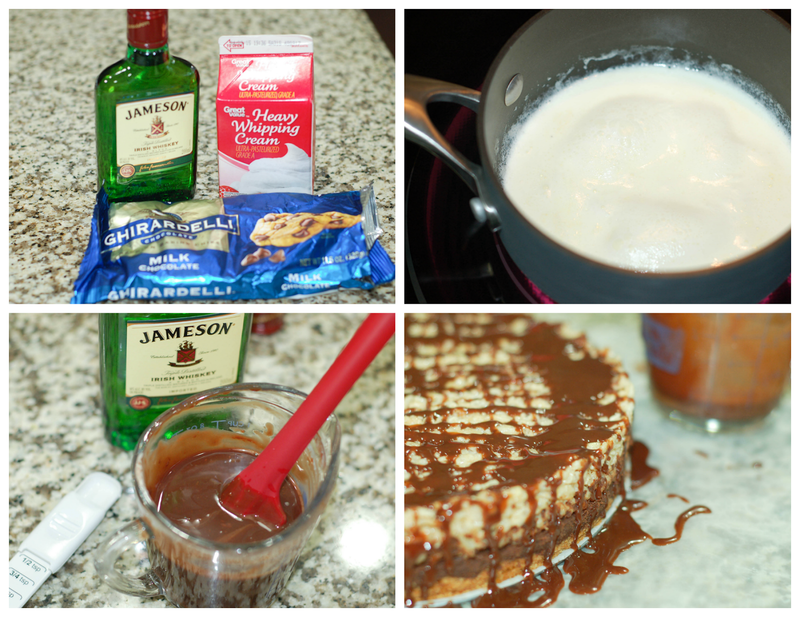 To top it off, I made a Jameson Whiskey Chocolate sauce. I just drizzled it over the top and let it pour down the sides. Don't worry, you can totally swipe your finger on the excess and lick it. You can drizzle a little or a lot, it's up to you. You can save the extra to add more drizzle to your slices if you like, or just pour it over some ice cream. We are not done yet. I also wanted to add some caramel. 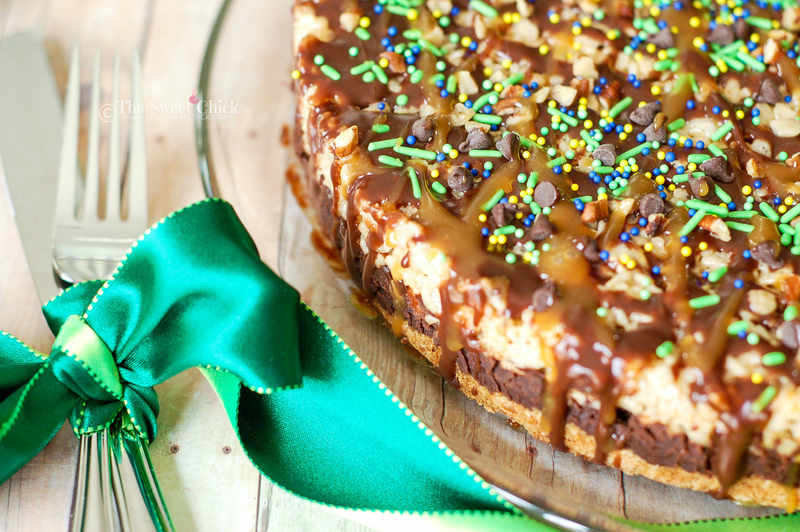 You can use caramel or caramel topping for this. Just drizzle a little or a lot over the top of the chocolate sauce. 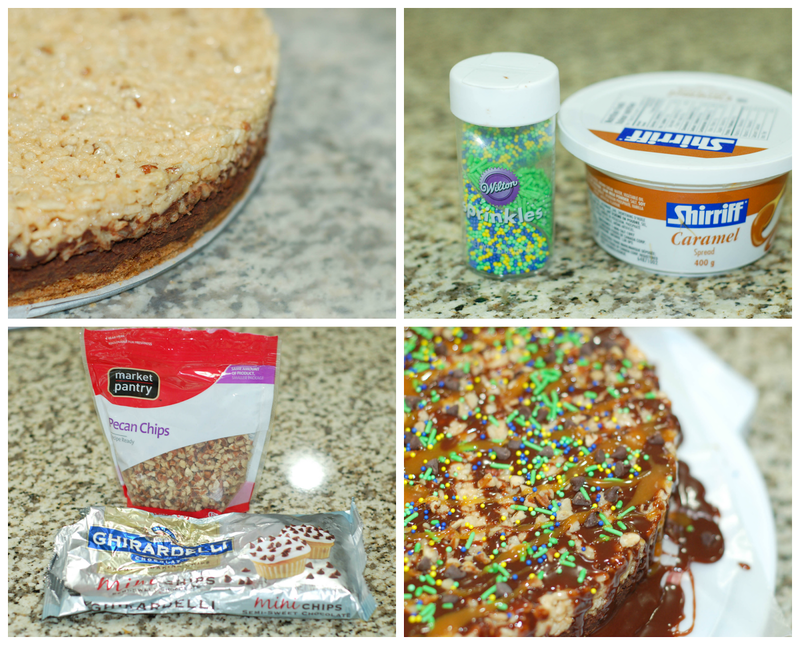 Other optional toppings are sprinkles, chopped pecans, mini chocolate chips, or crushed pretzels. The toppings will take your pie from "blah" to "ta-da! ", so have fun with it. You can leave the pie like this or you can add one more decoration, a Baileys Whipped Mascarpone Frosting. 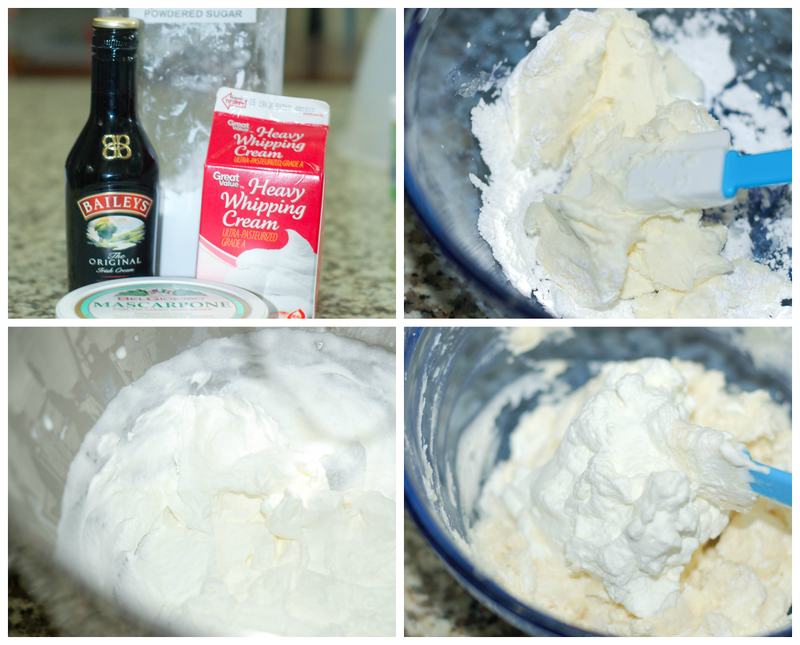 I just took my favorite mascarpone frosting and added Baileys. You will not believe how incredibly delicious it is. You can pipe it on the pie (I used a Wilton #32 tip) or you can just add a dollop to your slice as you serve it. It adds more Baileys flavor to the pie since the dark chocolate ganache kind of takes over the Baileys flavor in the Rice Krispie layer. The frosting is very light, like a whipped cream. The flavors and textures in this pie come together so well. The salty/sweet crust crumbles as you eat it. The chocolate ganache is so intensely dark, it pairs well with the salt in the crust and the sweetness of the toppings. The Rice Krispie layer adds a nice little crunch to the whole flavor experience. 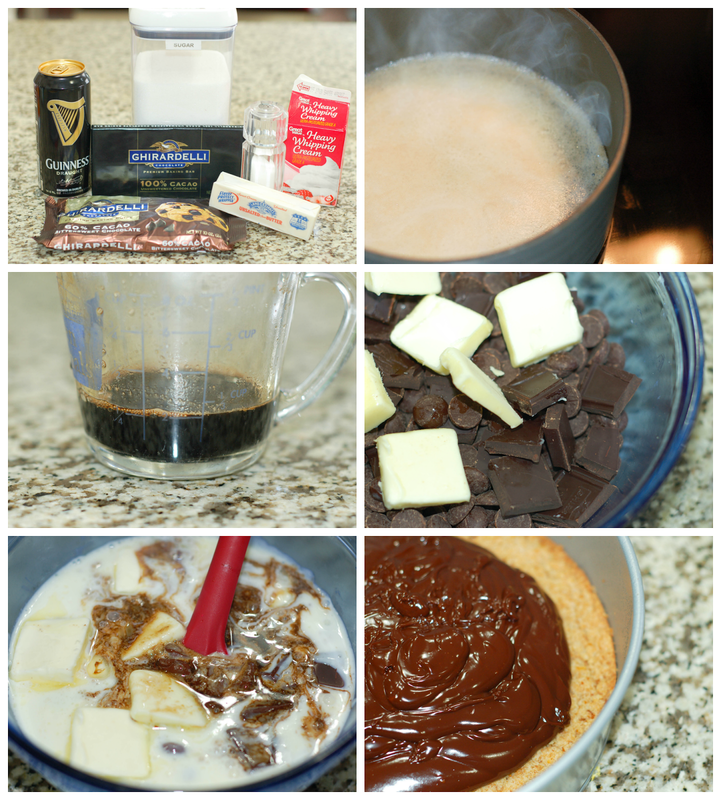 The chocolate whiskey sauce and Baileys whipped frosting just take it over the edge. I wouldn't change a thing. 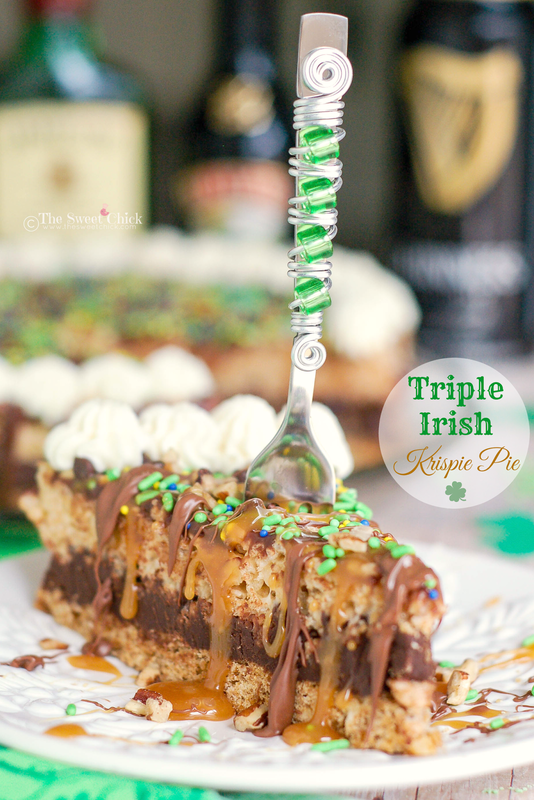 I can't wait to serve this Triple Irish Krispie Pie to my guests this weekend. They are going to love it. Preheat oven to 350°F. Line the bottom of a 10 inch round spring-form cake pan with parchment paper and spray the paper and the sides of the pan with non-stick spray ( I used Baker's Joy). 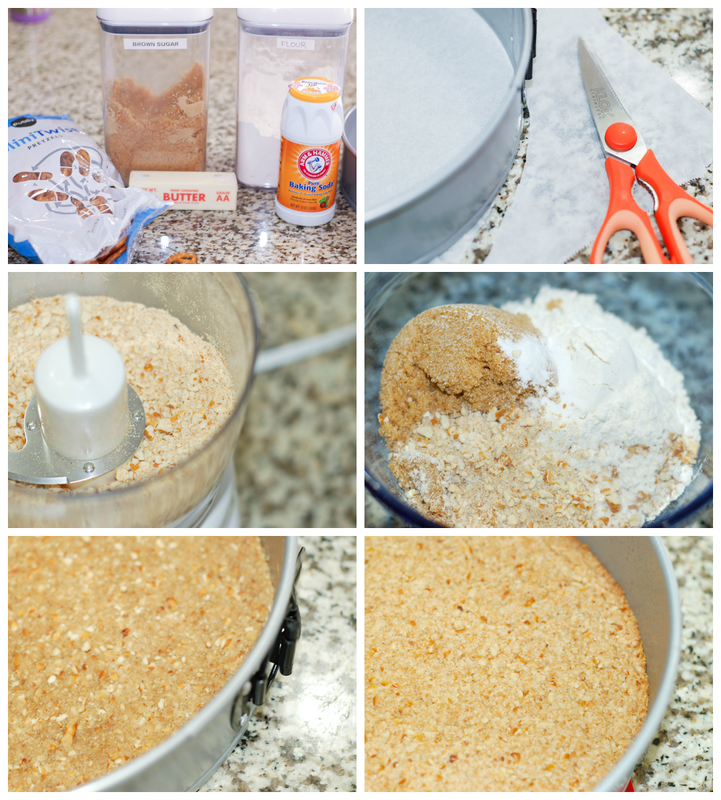 In a medium bowl combine the flour, crushed pretzels, brown sugar, and baking soda. Then add the melted butter and mix with a spoon until well combined and mixture in crumbly. Dump mixture in the bottom of the spring-form pan and pressing with your hands, evenly distribute the mixture. In a medium saucepan, bring the beer to a boil on medium/high heat. Boil for 20-25 minutes or until the liquid is reduced to 1/4 cup. Set aside. Place chocolate chips, chopped chocolate and butter in a medium bowl. Set aside. Mix cream, sugar, and salt in a small saucepan over medium heat and stir until sugar dissolves and liquid is just at a simmer, about 4 minutes. Pour the cream mixture over the chocolate and butter and let sit for about 2 minutes or so, then gently stir until smooth and glossy. Pour ganache over the cooled pretzel crust and transfer to the fridge. Chill until set, about 1 1/2 to 2 hours. Remove pie from the fridge. In a medium sauce pan, melt butter and marshmallows over low heat. Stir until completely melted. Remove from heat and the white chocolate chips. Stir until chips are melted. Then add the Baileys and mix well. Add Rice Krispies and the pecans. Stir until completely incorporated. Pour the mixture over the chilled ganache and spread it evenly with a piece of greased waxed paper, pressing down so the mixture adheres to the ganache. 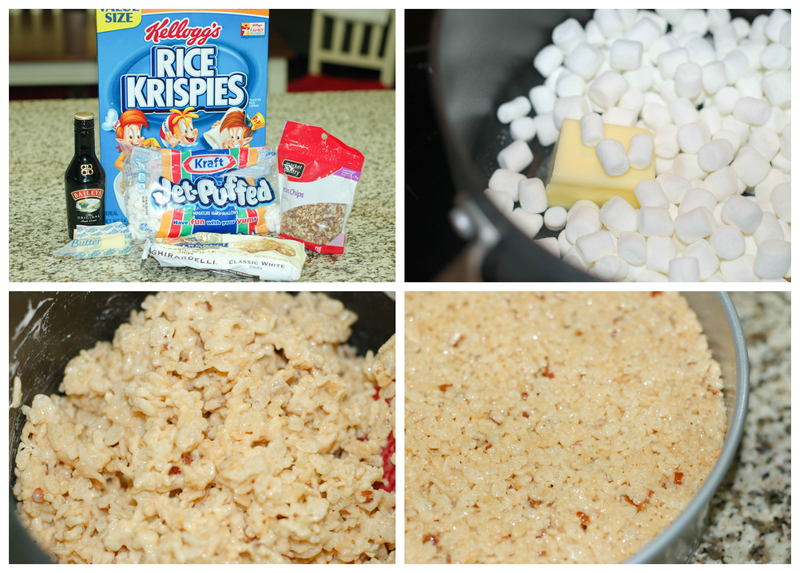 Place the pie back in the fridge for the Rice Krispies to set while you make the chocolate sauce. Place the chocolate chips in a glass measuring cup with a spout. Set aside. In a small sauce pan, bring cream to a boil over medium heat. Pour cream over the chocolate and let it sit for about two minutes, then stir with a small spatula or fork until mixture becomes smooth and glossy. Add whiskey and mix well. Remove the pie from the fridge and remove the sides of the spring-form pan (I left the bottom on for now). Place the pie on a sheet of wax paper or on a cooling rack with a sheet of wax paper underneath to catch the drips. Using the measuring cup, drizzle the sauce over the top of the pie. I did mine in a checkerboard pattern, letting some of the sauce drip down the sides. Allow the glaze to set for about 10 minutes before adding the caramel. If you are not adding the caramel, add any other optional toppings before the sauce sets. At this point I removed the bottom of the spring-form pan and the parchment paper. I placed the pie in a serving dish. In another bowl, blend together mascarpone and confectioners' sugar until smooth. Add the Baileys and mix well. Decorate the top of the pie any way you like. I used a Wilton #32 tip to decorate the edges of the pie. I kept the remaining whipped topping to add to the slices as I served them. You can save the extra topping for your ice cream or just eat it all. Do keep it refrigerated though. If you are adding sprinkles, mini chocolate chips, pecans, or pretzel bits, add them before the chocolate sauce sets. Pretzel crust recipe from Baker's Royale.